Behind him rode four figures in black cloth, their eyes on their prey. The man suddenly twisted, grabbing an arrow in swift motion and stringing it on onto the ivory bow that had been given to him from his father, the Emperor. Zhu Zhan Ye gritted his teeth and let loose an arrow, the taunt string ripping the skin off his fingers as he let go. It sang through the air, striking one of the black cloth men in the chest. With a garbled scream the man fell from the horse. Two arrows flew at him the same time that his arrow left his hand. Grabbing his sword, Zhu Zhan Ye deflect the two arrows, gritting his teeth in frustration. A sudden jolt threw him from the saddle, his horse screamed in agony as its legs were sheared off by a cold flash of silver. Zhu Zhan Ye landed with a heavy thud but quickly rolled to his feet. Coppery blood welled up to his lips but he forcefully swallowed it down as he coldly stared at the scene behind him. A voice as cold as ice cut the air. A man in gold robes strolled from behind the people in black. Zhu Zhan Ye’s pupils tightened as he recognized the man. The Crown Prince Zhu Ming. But he wasn’t wearing the clothes of a crown prince. He wore the clothes of an emperor. A bitter smile came to Zhu Zhan Ye’s dry cracked lips, thin slivers of blood ran from his mouth and stained his teeth to a hair raising red. “So it’s true, Father is dead.” Zhu Zhan Ye’s voice was emotionless. 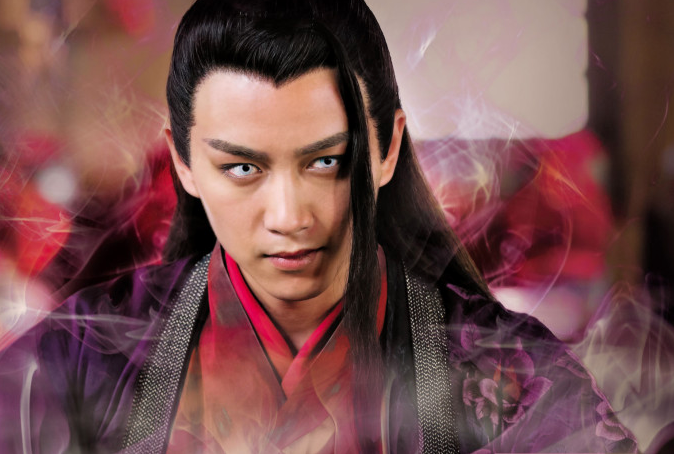 Zhu Zhan Ye’s heart fell as his face drained in color. Zhu Zhan Ye winced. He remembered Zhuo Hao’s betrayal. His heart shuddered with pain as he thought of that girl, who even in death was inked into his mind. He had promised he would wait for her return. But as fate would have it, the death of his father and the worry for his mother made him leave the place where her ashes were spread. Zhu Zhan Ye shook his head as if to rid of himself of Yu Zhu’s shadow. At the sound of his voice the twenty two assassins raised their weapons and ran for Zhu Zhan Ye. He fought like a lion, cutting down one man after another. Zhu Ming’s brows furrowed slightly as he looked at Zhu Zhan Ye. The poison should have started working by now. Slowly, after Zhu Zhan Ye killed seven men, he began to feel the poison seep into his blood. With a second of broken concentration, a sword pierced his shoulder, cutting through bone. Another sliced as his arm, Zhu Zhan Ye blocked but stabbed in the back. The men were gaining, after another hour, Zhu Zhan Ye’s body was covered in deep red gashes, his robes already the color of blood. Zhu Ming raised a hand and his assassins backed away from Zhu Zhan Ye. Zhu Ming came foward, Zhu Zhan Ye swayed on the ground. “One more chance, brother. What do you choose, life or death?” The voice drawled. He lunged at Zhu Ming with speed that made Zhu Ming back away in horror. But he wasn’t able to avoid the tip of the blade which sliced into his cheek. It was a scar he would wear for the rest of his life. Three arrows thudded into Zhu Zhan Ye’s chest, he took a step back and tried to raise his sword again. Three more arrows shot through him. The sword clattered out of his hand as he fell, the bloody robes dragging him onto the wild green grass. He lay there, looking at the bright blue sky, blood clouding his vision. Zhu Ming turned around, behind him a retinue of the Emperor’s Guard had arrived, they had shot the prince to death. The hundred men in the Guard came off their horses and knelt to their Emperor. With a vicious stomp, he crushed his boot between his brother’s eyes. Then he grinned, “My kingdom grows.” The assassins knelt in unison and shouted, “Emperor, your reign will be long and prosperous!” Zhu Ming laughed, his high laugh soaring through the windy plains like the screams of an eagle. Zhu Ming scoffed, “Let the wolves tear him to pieces.” Then he thought for a moment, ” Fifty of you remain. In case his people have followed him. Kill them too.” Zhu Ming’s eyes flashed dangerously as he aproached the captain of his guard and spoke softly, “When you see fit, make sure that the assassins I brought are taken care of. I don’t want to ever see their faces again.” The guard captain nodded, glad that he had not come any sooner to hear what Zhu Zhan Ye had said to Zhu Ming. Otherwise he might be dead as well. With that Zhu Ming, the New Emperor walked away, his boot trailing with the blood of his brother. The tall grasses russeled as the fifty men set up camp a little farther from the body. None of them wanted to look at the dead prince, much less stay near him. Zhu Zhan Ye’s body was like a bright bloom of flower in a sea of emerald. The grass around him rustled, unsure of what to make of the object that lay in their midst. One of the men peered at body and sighed. He was an older soldier who had seen better days. Zhu Zhan Ye was a good prince who might have been an excellent ruler. But the Gods were not kind to those who were born in royal families. Slowly, quietly, he took a rough sack and covered the Prince’s face, those eyes still staring at the sky with anger. The solider walked away. He wasn’t able to see the pale spirit of Zhu Zhan Ye that sat beside the body. If this was any other time, Zhu Zhan Ye’s spirit would have left the world to begin again as a mortal. But in this year, a powerful half god had awoke, and he could feel her presence, however feeble. For he had slept a very, very long time, waiting for the day that another half god would rise. Long ago, he had made a promise, that when another one like him woke, he would follow. His half blood felt the stir of magic that called to him, a sound like flute music from far away, growing stronger and stronger by the minute. Zhu Zhan Ye’s spirit felt as if he was slowly falling asleep, bits and pieces of his soul were breaking like craking ice. He didn’t know what was happening and he felt a strong sense that he was slipping into an eternal abysess, like the earth had lost its pull on him. He struggled to stay awake, to stay alive. Suddenly a voice sounded in his consciousness, stop struggling fool. Who are you? Asked Zhu Zhan Ye. The voice, clearly male seemed amused, I’m you. Well, I am whole, and a god. You’re just a piece of my shadow that I used to make my mortal self. And now I’m awake, you’ll slowly become a part of me again. Or part of my shadow anyway. It’s not that important. You’re dying. Concentrate on that. Zhu Zhan Ye felt as if someone exploded a bomb on him. Why are you doing this? He asked as he struggled with the overwhelming feeling of exhaustion. What do you want? Well, chaos and confusion, for starters. But I don’t know, depends on how I feel. the voice seemed nonchalant, You ask a lot of questions for someone who really doesn’t exist. Zhu Zhan Ye felt a power, overwhelming like the rush of the tornado hit him. Suddenly all he could feel was darkness. Jin sighed as the last bit of Zhu Zhan Ye’s soul broke into pieces, and he was free at last. His consciousness had been locked for so long in those pieces that he didn’t even think he would ever wake up. Gold light began to shine from the pieces of soul as they grew and grew. In that mere mortal shell the Half God who had been asleep awoke with a roar of delight. The earth began to shake and the men on the grassy plain fell to their knees in fear. They were hardened men who believed in only luck and their swords but never in their lives had they felt such power. In Heaven the Dragon Emperor looked at his mirror that showed him the mortal realms with a cold smile. “He’s awake at last.” He muttered to himself, conflict shone in his eyes. Jin soul dove into the earth and quickly began to gather strength from every bit of life he found. In an instant, the sea of emerald grass turned brown. A gust of wind blew through and the plants turned to powder. The men looked at area in horror. What was a vibrant earth now was grey and cracked. It would not support life within a thousand years. They looked at the body of the dead prince and with a terrible jolt in their hearts they saw that it was no longer laying down. Instead, the prince was alive again. Standing in the middle of the field, his eyes closed as if he had fallen asleep that way. The wounds on his face was healing in front of their eyes. Jin opened his eyes and stretched lazily, like a cat after a nap. But his eyes were the color of molten gold, not the black of humans. He looked around, and saw that the men in front of him, not looking at him with the expression he had hoped for. The crowd infront of him was still shocked and stood like wooden statues. Jin raised an eyebrow, “If none of you will say anything, I will assume you are all dumb. I will have no use for any of you.” He stretched his neck lazily, “I am not often this kind. Nor this patient. Usually I step on ants. Not talk to them.” The men bristled at his lackadaisical tune. Some of the men tried not to roll their eyes. It wasn’t that the Prince Zhu Zhan Ye wasn’t handsome, it was that they had never seen him so egotistical. Or self loving. Hearing this, the soldiers and assassins leapt into action, their pride offended at the man’s haughtiness and self importance. So what it seemed that this man just rose from the dead. So what that they had seen him die once. They’ll just kill him again. And if he keeps rising up from the dead, they’ll just continue killing him again and again until he could no longer laugh at them. Jin looked at them in alarm, “Wait. But I haven’t gotten the information yet.” To his utter surprise, none of them stopped to explain why they were suddenly so intent on killing him. Jin shook his head and pointed. Lightening crackled over his skin and split into a thousand fine hairs. It struck the men in their hearts, stealing their lives in an instant. Dead bodies fell like leaves to the grey cracked earth. What was once a noise filled plain was silent and empty. In the blink of an eye only one soldier was left alive. He was the one who had put a blanket on the face of the dead prince. The man considered running but Jin merely smiled, his gold eyes flashed dangerously. The man felt his legs shake as he slowly made his way across the bodies of dead compatriots, their faces still showing the utter horror and surprise. The old soldier sat down, his eyes downcast and his hands trembling. “Do you have children?” Jin asked curiously after taking a long, satisfied sip of his tea. The old solider looked up in surprise, and that one look nearly stopped his heart then and there. On the face of the dead and now alive prince, there was a thin golden crack. Like the cracks on walls. It was slowly spreading. Jin smiled, “What if your son wanted your life. Would you give it?” The old soldier was taken a back for a moment, and said nothing. A white hand reached towards the top of the old man’s head and he heard his skull crack under the enormous pressure of that hand. The old soldier’s eyes began to darken, he felt as if everything was concentrated where the hand lay. Suddenly the pressure was gone and the old soldier let out a long sigh of relief. Jin: You know, if you take any longer to write this book, we, your characters, would all be dead from old age. What kind of author are you? Author: Wait. I just took the time to explain your backstory and now you’re turning your poisoned tongue at me? *looks at Yu Zhu for help, support, comfort…. etc. Yu Zhu barely glances over from cleaning her sword: Don’t look at me, last time I checked I was still stuck on the moon. Because someone decided to take a hiatus. And don’t forget about Hua Er. I don’t even know what’s going on anymore. How long do you plan to drag things out? Hua Er looks at the author with barely hidden distain: Hurry up or I will disown you. You left me to deal with all the guilt and worry, and trust me, this will have consequences on your well being. Author: Wait… wait there’s good reason why I haven’t written, I wanted to let my ideas stew, you know, make it rich and meaty. Huang Wu: I could make a stew out of you. I got a kiss from a completely drugged girl. Did you ask if I liked her? Lin Yu *smiles and flips a dagger in her hand playful/threateningly at Huang Wu: Oh yeah? Well maybe I’ll ask the author to write a chapter where I yank off all your feathers and make it into a nice, feather down comforter. That’ll really give you something to complain about. Lin Yu shoves Author away: Don’t even get me started on you, missy. What kind of monster leaves my fate up to an idiot like Huang Wu. Even Tinder has better dating options. Author: wait… but you’re in ancient China. you’re not allowed to know what tinder is! Lin Yu: Then maybe you should have paid more attention to us. I’m allowed to activities outside of you too. Zhuo Hao * quietly snorts in the background. Watching drama unfold without comment. Ignores Author’s plea for understanding. Wei Yun looks at author with cold eyes, freezing her thoroughly into a popsicle of fear: Clearly you’ve forgotten me. Jin chuckles: Or maybe she’s throwing you away for someone like me. Hot. Perfect. Has more than three facial expressions and can speak more than five words at a time. Author feeling the pressure of her two male leads as they wordlessly murder her with their eyes. Actually from all the character’s eyes. Author, going pale with the realization that even literary characters commit violent crimes if pushed past a certain point: Ahem, I would like to announce that I am back on. Officially. Chapters every weekend. Now I have to go and hide from my own creations. Thanks for coming back. I’d love the weekend even more now. I miss all the characters. Will know more about Jin now, but it’s another character already, he will no longer be that prince. I’m so happy you are back,I missed this story…keep the hard work!!!!! And btw, I love love love your dialogue with your characters! I couldn’t stop smiling. “pluck his feathers to make a nice down comforter”. Haha! How about making a nice down jacket for me for the winter? 😉 Thank you and until next time! I miss you. I’m glad you are back. Great,funny dialogue .thanks for continuing. You write with such great depth and plot build up, not to mention bringing the characters full of life and intensity..INSANELY GOOD! Been re-reading a bunch of time..NEVER GETS OLD!! Welcome welcome welcome back! I love d Tinder part hahahhahah. .. Thank you soooooo much for coming back!!!! I just started reading your story yesterday and I’m waiting for new chapters!!! Love love love your story =) hope Yu Zhu ends up with Wei Yun. Hi, how are you doing? Is everything fine? Hi! Good, sry my computer broke down and I’ve been kind of powerless to write for a few day. Thank you for the thought! Thanks! Once I’m through the crazy week (broken car, broken computer, etc.) I’m sure everything will be back on track. Welcome back! No please… Don’t throw away Wei Yun.. You’re story is probably one of those rare ones where I cant tell who’s the OTP, and I’m rooting hard for YZxWY! im realy happy that your back !! I like both OF them , WY and ZZY . im not sure right now who prefer with YZ. anyway do your best ! you don’t want to anger your charachters !! thanks! I’m not crazy enough to anger any of them, esp Jin and YZ. I think that both ZZY (Jin) and WY have their strengths and weaknesses but I’m excited for the readers to find out who!